The US Mint recently announced that 10 million quarters with the "W" mint mark of the West Point Mint would be released into circulation at random. These are the first quarters to feature a "W" mint mark and they are comparatively rare — less than 1% of all 2019-dated quarters will have the "W" mint mark. Five different 2019-W Quarter designs will be released this year as part of the America the Beautiful Quarters Series. Each design will have a mintage of just 2 million pieces with the "W" mint mark. The release of the first 2019-W Quarter design, which commemorates Lowell National Historical Park in Massachusetts, coincides with 96th annual National Coin Week, held the third week of April. This year, a group of coin dealers created the Great American Coin Hunt promotion to draw further attention to National Coin Week and the coin collecting hobby. Pyfrom had learned about the valuable 2019-W Quarters only a day before he found one in his change from a coffee shop in Burbank, California. "I had just heard about the Great American Coin Hunt and these ‘W’ quarters the day before," said Pyfrom, 32. "I heard they were not in circulation yet, so I was thrilled to find one!" Pyfrom brought the coin to a local dealer, who immediately sent it to NGC for certification. NGC then confirmed that the coin was the first 2019-W Quarter that it had received. 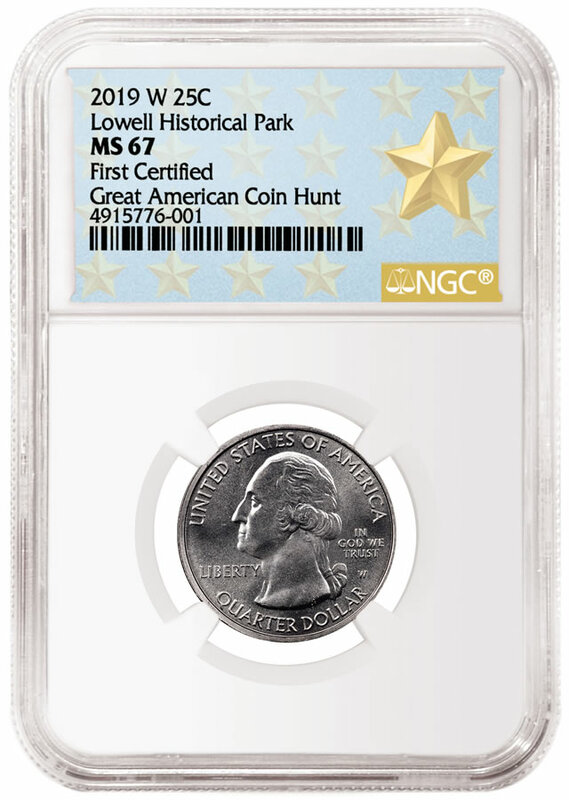 The coin is now graded NGC MS 67 and encapsulated with a label noting its significance: "First Certified" and "Great American Coin Hunt." "This is a really exciting time in numismatics" said Rick Montgomery, NGC President and Grading Finalizer. "Mr. Pyfrom’s find shows that the US Mint is getting more people to look at their change, and that can only be a positive for numismatics." In addition to the Lowell quarters, the US Mint will strike quarters in 2019 to commemorate American Memorial Park (Northern Mariana Islands), War in the Pacific National Historical Park (Guam), San Antonio Missions National Historic Park (Texas) and Frank Church River of No Return Wilderness (Idaho). To learn more about the 2019-W Quarters and see how to submit them to NGC for certification, visit NGCcoin.com. As much as I’m sad I didn’t find it I’m happy an actor found it maybe now he will help the coin collecting world by spreading the word that collecting is cool and get more people into it.